In addition to an indoor pool, Hilton Garden Inn- Grand Forks/UND provides a spa tub and a fitness center. The hotel offers a restaurant. A bar/lounge is on site where guests can unwind with a drink. Wired and wireless Internet access is complimentary. A 24-hour business center is on site at this 3-star property. 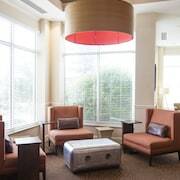 This business-friendly hotel also offers gift shops/newsstands, complimentary newspapers in the lobby, and a fireplace in the lobby. Onsite self parking is complimentary. Hilton Garden Inn- Grand Forks/UND is a smoke-free property. Situated in Grand Forks, this hotel is within 1 mi (2 km) of North Dakota Museum of Art, University of North Dakota, and Alerus Center. Columbia Mall is 2.7 mi (4.3 km) away. Grand Forks Station is 25 minutes by foot. All 105 rooms provide free WiFi and free wired Internet, LCD TVs with satellite channels, and conveniences like refrigerators and microwaves. Other amenities available to guests include room service, free weekday newspapers, and hair dryers. Hilton Garden Inn- Grand Forks/UND offers 105 air-conditioned accommodations with complimentary weekday newspapers and hair dryers. LCD televisions come with premium satellite channels and pay movies. Guests can make use of the in-room refrigerators and microwaves. Bathrooms include shower/tub combinations and complimentary toiletries. Guests can surf the web using the complimentary wired and wireless Internet access. Business-friendly amenities include desks and phones. Housekeeping is provided daily. Hilton Hanger - Onsite lobby lounge.